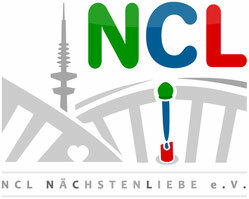 NEURONALE CEROID LIPOFUSZINOSE - ncl-naechstenliebes Webseite! Neuronal Ceroid Lipofuscinosis What is NCL? NCL is a lysosomal storage disease also called Spielmeyer-Voigt-Syndrom or Batten Disease. It is a very rare metabolic disorder that is inherited by both parents with a 25% chance. In every human body metabolic waste products accumulate in the lysosomes of cells like neurons. These waste products have to be degraded to maintain proper cell function. If one of the enzymes responsible for this degradation process does not work correctly, cells may be blocked and die. This happens in case of NCL. At the beginning only the eyes are affected, when the disease progresses all neuronal cells. There are many families where several children are affected. The development of the children appears normal until approximately five years of age. Then they become blind within a few years, and the diagnosis NCL completely changes the family's life. All cognitive and physical abilities are lost, and the young adults end up in the wheelchair and are incontinent very early. Furthermore the quality of life is impaired by massive epileptical seizures. Since the children's immune system is in a very bad condition, they finally die because of a simple infection. The average life expectancy is twenty-five years. The knowledge that the children's life is going to end early needs a lot of strength and endurance every day. The wish to design the daily life comfortable and joyful requires creativity.